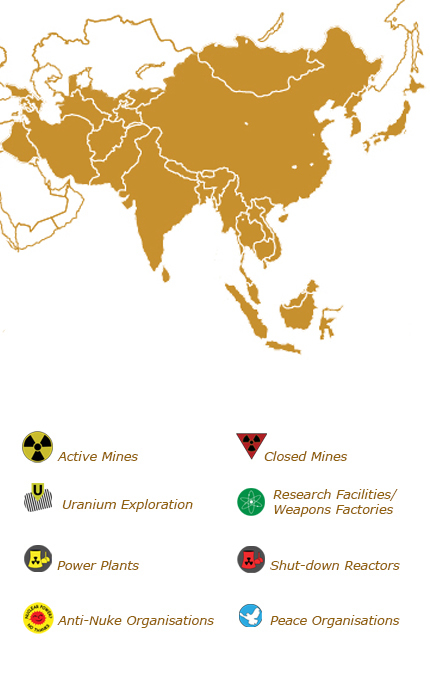 Asia is the main region in the world where specifically nuclear power is growing. In East through to South Asia there are 98 operable nuclear power reactors, 49 under construction. Four-fifths of all new-build units (62) are in Asia and Eastern Europe, of which half (24) are in China alone. Over 60 percent (38) of the units under construction are located in just three countries: China, India, and Russia. Developments in Asia, and particularly in China, do not fundamentally change the global picture. Reported figures for China’s 2020 target for installed nuclear capacity have fluctuated between 40 GW and 120 GW in the past. The freeze of construction initiation for almost two years and new siting authorizations for four years has reduced Chinese ambitions. In 2014, China installed more wind power and solar photovoltaics than any other country, so worldwide it now has the largest capacity of wind power and the second largest of solar photovoltaics. China also installed more nuclear capacity in 2014 than any other country. Investment in renewables in China was by far the largest of any country with a total of US$ 83.3 billion of which solar PV was US$40 billion and wind power was US$38 billion. On the other hand, total investment in nuclear power was US$ 9.1 billion, down 13.8 percent. *) in Japan since Fukushima are 48 reactors shut down, 2 are since August an Octobre in operation. In China has pursued multiple SMR designs but the most advanced of these, and the one currently under construction, is the High Temperature Reactor (HTR) that it has developed since the 1970s. In turn, the Chinese design was based on the prior failed German effort to commercialize the technology”. China did not start a single new construction in 2014, but had done two in the first half of 2015—so far the world’s only starts. In India, the main new SMR design that India has been developing since the 1990s is the Advanced Heavy Water Reactor (AHWR). The AHWR has also been repeatedly delayed. In 2003, the director of the Bhabha Atomic Research Centre in Mumbai announced at a meeting of the Indian Nuclear Society that the AHWR’s “construction is proposed to be started within 2 years time”. Speaking to the Indian Science Congress in 2007, Atomic Energy Commission Chairman Anil Kakodkar promised: “We will start the construction on the AHWR sometime this year”.243 That hasn’t happened, but in December 2014, the DAE informed the Indian Parliament that the reactor is likely to be functional by 2020. In Japan, 4 years after Fukushima accident the number of evacuees from Fukushima Prefecture as of January 2015 was about 120,000 (vs. 164,000 at the peak in June 2013). About 3,200 people have died for reasons related to the evacuation, such as decreased physical condition or suicide (all classified as earthquakearelated deaths”). Among these, about 1,800 people (more than half) are from Fukushima Prefecture. Many evacuated people have given up on returning to their homes even if the restrictions are lifted. 48 of 50 reactors are since the accident shut down. The power sector is in a period of profound transformation. New technology and policy developments favor decentralized systems and renewable energies. As these are generally not owned by incumbent electricity utilities, these developments are at best unfavorable and potentially a real threat for the nuclear industries and utilities. South Korea has been developing the System-Integrated Modular Advanced Reactor (SMART) for nearly two decades. The project to develop an SMR was launched by the Korea Atomic Energy Research Institute (KAERI) in 1996. The result was the SMART design, which has received extensive Korean government and industry support. In 2010, a consortium consisting of Korea Electric Power Corporation, POSCO, STX Heavy Industries, Daewoo, Iljin, and Samchang pledged to contribute 100 billion won (about $83 million) to complete design work on the SMART. Like other SMRs, the SMART has also been long delayed.